Feb 8 15:14: Magnitude recalculated from 5.2 to 4.6. Hypocenter depth recalculated from 124.0 to 119.0 km. 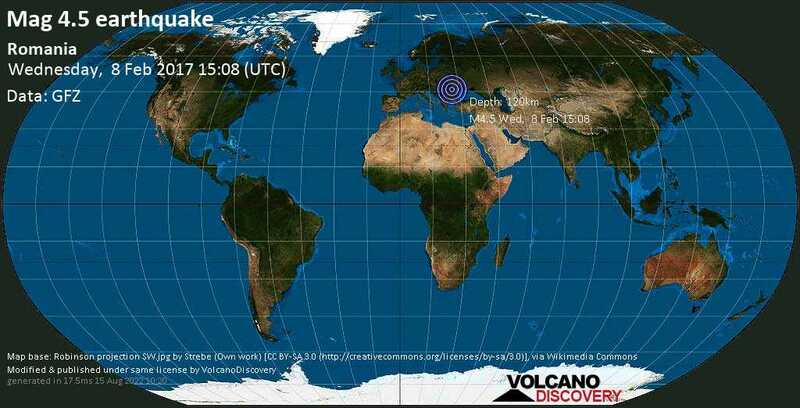 Feb 8 15:19: Magnitude recalculated from 4.6 to 4.5. Hypocenter depth recalculated from 119.0 to 120.0 km. Chisinau, Republic of Moldova / MMI III (Weak shaking): Located at the 5th floor, have felt the chair shaking under me. Felt very light, i would say 1-2 on Richter. Bucharest, Cotroceni / MMI V (Moderate shaking): Bucharest: One strong enough, neat shake. No objects fell in the house.